Today's project feature the Sweet Cupcake bundle. This is one of my all time favorite sets. 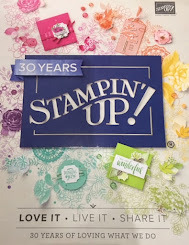 You know I love 2-step stamps and this one is awesome! Again, so many possibilities. :) The font in this set is also perfect for any gender. I actually cased this card straight from our catalog. Any opportunity I get to use the 2017-2019 In Colors, I take it. I'm back at it....making note card sets again!! I do love note cards. They are the perfect size for any occasion. Today's project features the Colorful Seasons bundle as well as the Color Theory Designer Series Paper Stack. This bundle is a MUST HAVE since it has something for every season. What's better than a set you can use all year long!! I have a full supply list below where you shop by clicking directly on the pictures or going straight to my online store HERE. Today's project features the June 2017 Paper Pumpkin kit - One in a Melon. What a cute kit!!! This month's kit included 6 note cards with envelopes and 4 bags. The colors in this kit make me SO happy!! I must have been dreaming of Paper Pumpkin because I used these colors in a project last week. Of course, demonstrators don't know in advance about kits but these were perfect summer colors. You can also pre-pay for Paper Pumpkin which means you can choose which month you would like a kit or you can purchase a kit for a friend/family member as a gift. If you have any questions, email me HERE. Today's project features the Weather Together stamp set and framelits. I LOVE this set!! I had so much fun creating this card. This card I actually cased right out of our catalog (pg 93). 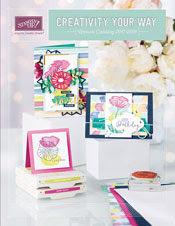 Our catalog is packed with inspiration and I love the look of this card. Plus, I got to use to some awesome colors! Today's project showcases another hostess set called Tranquil Tulips. This is a beautiful set!! It's a 2 step stamp set and has a watercolor feel to it. You can earn this hostess set by placing a $150 order in my online store HERE. Believe me...in this new catalog...it's very easy to earn hostess sets and there are a bunch of awesome ones. Today's project was specially created for a co-worker of mine who is celebrating her 30th anniversary. Wowzers!! 30 years is a long time! I created this fun and playful card for her using the Happy Birthday Gorgeous bundle as well as the Teeny Tiny Wishes and Large Number framelits. I think it turned out great!! I think she will LOVE it also! Hope you had a great weekend! Today's project features one of our NEW Hostess Sets called Feathery Friends. This is the cutest set! It's perfect for coloring!! Of course I had to color a coordinating envelope too! Today is the day!!!! Can you tell I'm screaming in glee from the rooftop?! Starting at 12 noon MST time, you can place your order HERE. It will be a crazy busy day so be patient...hopefully we don't break the Stampin' Up! website! If you don't have a catalog, you can find the PDF HERE. Shoot me an email HERE. For every order placed in my ONLINE STORE, leave your contact info and I will send you a welcome package! New customers will receive a catalog as well. Choose a $125 worth of current product for only $99!! First-Time Subscribers save 25% on first 3 months.